White scars can appear on the skin for several reasons. They are the result of damage to the skin that has caused a discoloration of the skin or a loss of pigment. These white scars can come in various shapes and sizes and are most notably the residual effects of acne. White scars can be treated through simple topical methods at home and through more serious--though still safe--methods in a dermatologist's office. 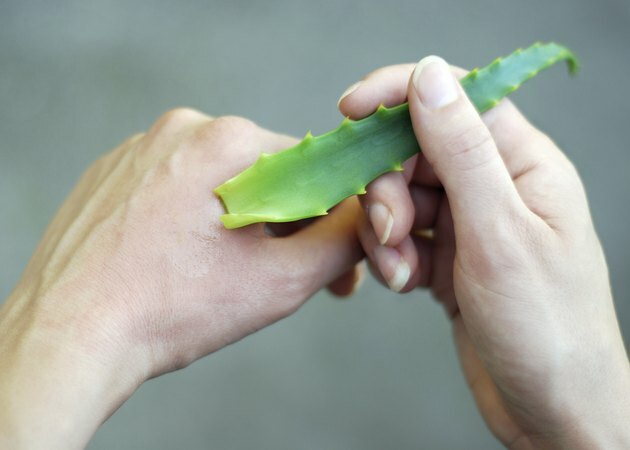 Apply aloe vera gel to a scar--particularly a freshly developed one--to diminish its visibility and eliminate it altogether. According to DailyGlow.com, this gel should be applied at least twice daily for maximum benefit. Apply natural treatments to your scar to restore its health. Honey is an antibiotic recommended by experts an effective remedy for scarring, according to DailyGlow.com. To treat skin, it is recommended that you purchase medicinal honey, rather than the standard edible honey found in grocery stores. The honey should be massaged into the scar and left on for 30 minutes or more for maximum benefit. Lemon juice is another remedy found naturally. It is high in vitamin C, which is a staple vitamin of your skin's health. Lemon juice can be applied to the skin on its own or mixed into rose water, then dabbed onto the skin several times throughout the day to reduce the visibility of your white scars. Place vitamin E oil onto scars on the skin. This vitamin is a strong antioxidant frequently found in capsule form. If you cannot find vitamin E oil on its own, purchase the capsules and prick them with a needle to squeeze the oil onto the skin, or use a cream or other skin oil containing vitamin E. Apply vitamin E to scars three times daily to slowly fade them out. Visit your dermatologist to discuss various treatment options that can be administered in a medical setting. Multiple possibilities exist, such as the use of microdermabrasion, which wears away a tiny part of the skin and enables new skin cells to develop and cover the old scarring area. Chemical peels are also purported to treat scarring on the skin, and laser treatments are commonly used to correct abnormalities in skin pigment. When factoring in the size and severity of your scar and the cost of the different alternatives, your dermatologist should be able to provide you with an effective and attainable solution to your white scars.